Because the math is identically the same whether you have one kind of stuff going forward and backward in time or two kinds of stuff only moving forwards in time. The Friedmann equation also describes the universe pretty well, if you include a number for the amount of dark matter and a number for the amount of dark energy in the universe, but it doesn't explain what dark matter and dark energy is. Similarly, the math might work out well by just doubling the g-factor you would expect from the magnetic moment of the electron and all possible virtual forward time interactions, but it doesn't necessarily explain why you need to double it. This isn't obvious. They really thought the g-factor should be around 1 before the Dirac equation. the consequences of Feynman diagrams being valid are far-reaching and affect waaaay more than the exact value of the g-factor. Moreover, I am not disputing their accuracy! Just, interpreting them does not require introducing backwards-propagation in time. There is a very good - preferred, even - physical interpretation of Feynman diagrams which does not change the predictions even one tiny bit from what you're talking about, yet also does not have any particles going back in time at all. You can include backwards-traveling particles if you want, and if you're only looking at the microscopic level. But when you zoom out to the point where entropy gets to be a consideration, you lose that option. That's just not compatible with what time means to us in our world. Couldn't it be that we come from different configurations of the universes, that for some reason converged into the configuration of the universe we have today? 1) Whether we have multiple pasts is one of those cases where it's not entirely clear. 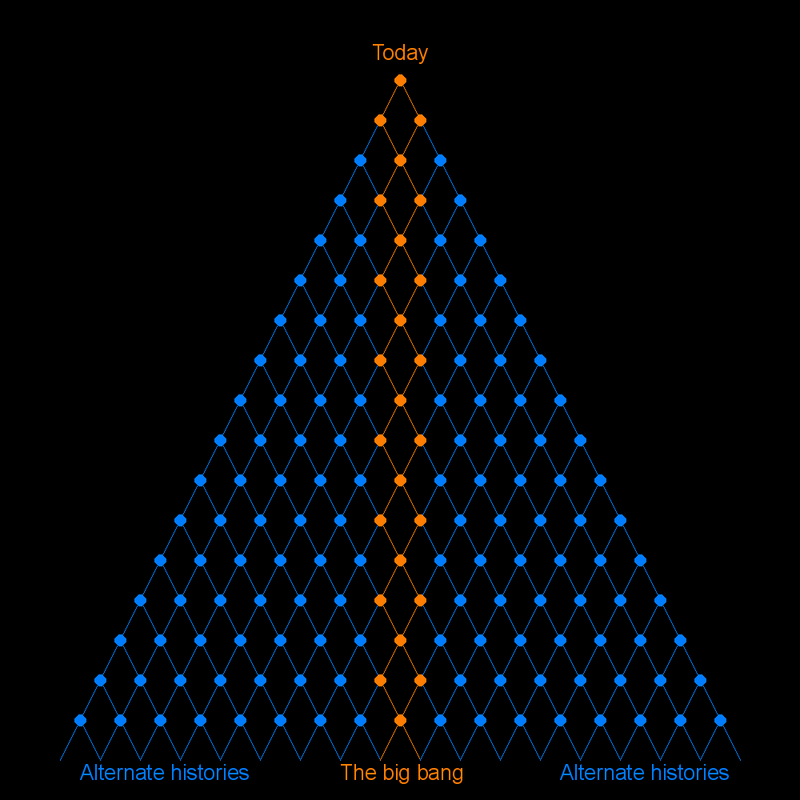 We definitely have multiple intermediary pasts (in a similar way to how we have multiple futures) in simple cases like a two-slit experiment, but the distant past looks so much like a low-entropy initial condition that in order for us to have multiple terminal pasts, its being low-entropy would have to be an illusion. 2) You've zoomed out to the level where backwards time travel makes less sense. Like, how would the universe fill in those dots? Would it start in the past and work its way forward, except when it has antimatter it puts… just… that backwards? But each of these is a total configuration of all particles in the universe. How would you send just part of it back? How do you even get 'ahead' of antimatter? Does there need to be a path to the future that doesn't involve any antimatter and then you get to fill it in from the other end? But due to the whole thing with the anomalous dipole moment as you've seen and the renormalization group in general, every regular particle carries a very small amount of antimatter around with it (and vice versa). If you don't take the 'flow of time is flow of information' route and everything is moving forwards, then you end up in contradictions and not knowing where information comes from. It ends up worse than IRS forms where they tell you to put numbers down on lines you've already filled out, because in that case it means you misread the instructions; if antimatter travels back in time, that's actually baked into the rules.